Gallery of the Louvre, 1831–33, Samuel F. B. Morse, American, 1791–1872, oil on canvas, 73 ¾ x 108 in. (187.3 x 274.3 cm) Terra Foundation for American Art, Daniel J. Terra Collection, 1992.51, Photography © Terra Foundation for American Art, Chicago. Samuel F. B. Morse (1791–1872) is better known today for his invention of the electromagnetic telegraph—and for "Morse" code—but he began his career as a painter and rose to the Presidency of the National Academy of Design in New York. The monumental Gallery of the Louvre is his masterwork, a canvas he created for the edification of his countrymen. The large painting will be shown in a theatrical setting as the kind of grand public display that Morse himself would have created in 1833. The beginning of Morse's pioneering efforts into new technologies—namely the electromagnetic telegraph and the medium of photography—can be found in the crafting of this one work of art, Gallery of the Louvre. This piece was Morse's ambitious effort to capture images of the Louvre's great paintings and transport them across the ocean and throughout the country, to the republic's young cities and villages, so that art and culture could grow there. Gallery of the Louvre, 1831–33, Samuel F. B. Morse, American, 1791–1872, oil on canvas, 73 ¾ x 108 in. (187.3 x 274.3 cm) Terra Foundation for American Art, Daniel J. Terra Collection, 1992.51. Photography © Terra Foundation for American Art, Chicago. Samuel F. B. Morse was a respected painter when he set sail from New York for Europe in 1829 to visit the princely picture galleries. As Morse took in the glories of the Louvre Museum in Paris, he recognized it as a model for the United States. The Louvre had been a royal palace but now it was a national museum displaying the royal treasures, open free to all, artists and art admirers alike. Morse had the idea to create the Louvre in miniature and transport it back to his country so that it could be viewed by students who lacked appropriate models for learning the art of painting and shared with all his countrymen, who still had few opportunities to see great art. 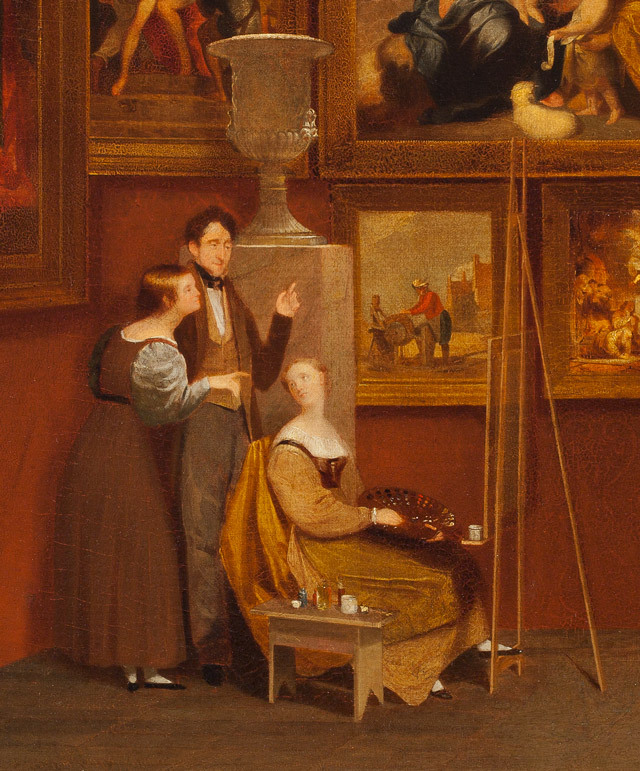 Morse has shown himself in the role of teacher here, at the very center of the scene, offering instruction to a young woman student who is copying one of the masterpieces before her. 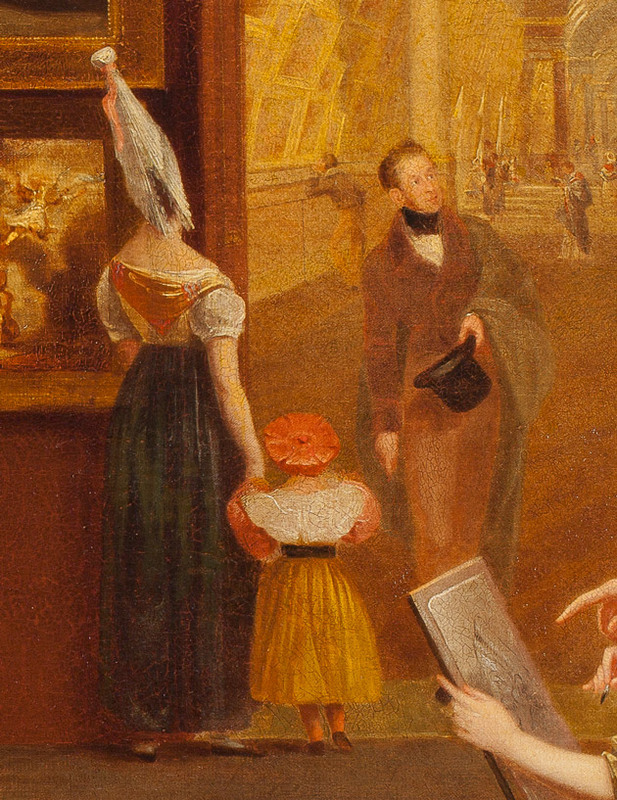 Gallery of the Louvre (detail), 1831–33, Samuel F. B. Morse. 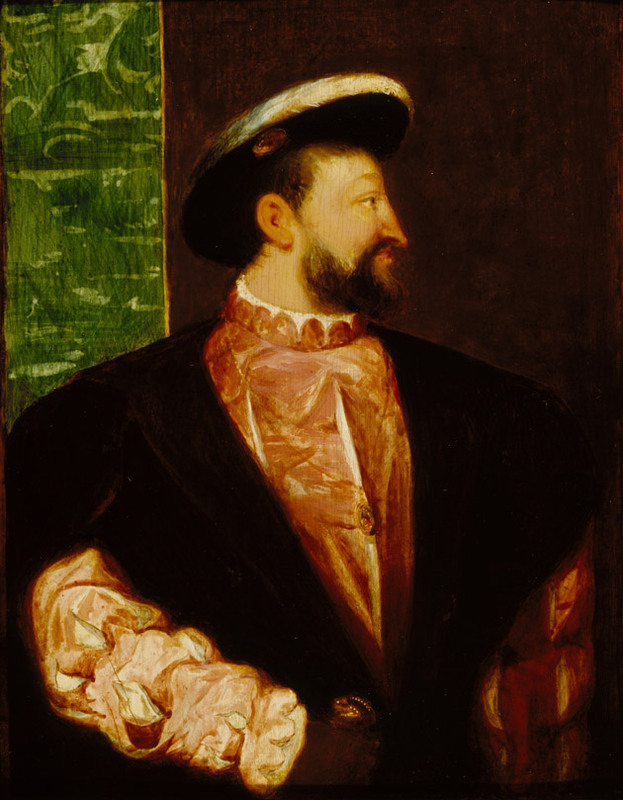 Francis I, after Titian, Study for Gallery of the Louvre, 1831-33. Oil on panel, Samuel F. B. Morse, American, 1791-1872, 10 x 8 in. Terra Foundation for American Art, Chicago. Gift of Berry-Hill Galleries in honor of Daniel J. Terra, c1984.5. ​Tiziano Vecello, known as Titian, (1488/9-1576, Italian), Francis I, 1539. In creating his picture of pictures, Morse worked daily, tirelessly, in the galleries of the Louvre making exact copies in miniatur​e of his favorite canvases. Probably at times he drew with the aid of a camera obscura, a box and lens device that allowed him to trace the outlines of a projected image. There is evidence that Morse pinned his miniature studies onto the canvas as he worked out his complex arrangement of pictures. An artist using a camera obscura in drawing. 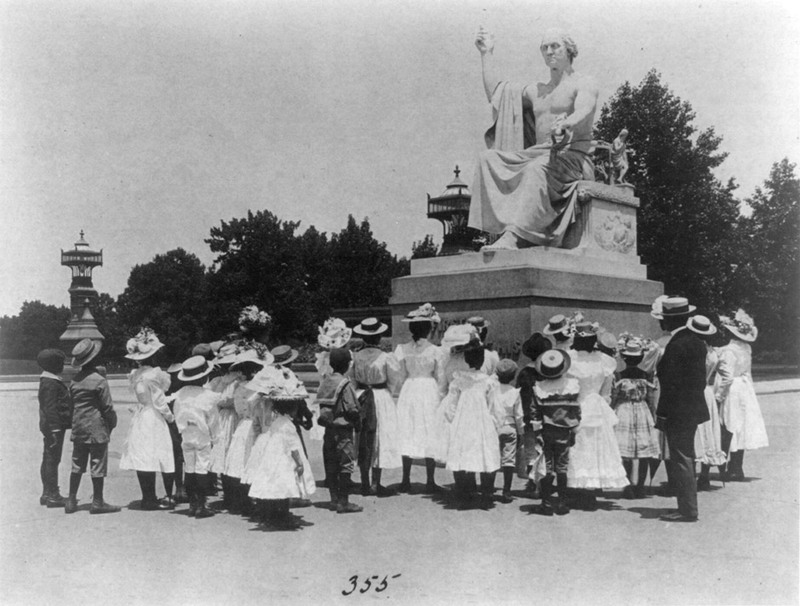 School children visit Horatio Greenough’s statue of George Washington at the U.S. Capitol. Probably 1899. Frances Benjamin Johnston (1864-1952) photographer. Richard West Habersham, a young American portraitist from Georgia, was Morse’s roommate in Paris, and it is believed Morse added him to the picture, thus providing a lasting tribute to an artist who in reality fell into obscurity. Habersham is at work on a landscape study, although he does not appear to be directly copying any of the landscapes or seascapes—works by Nicolas Poussin or Claude Lorraine—that Morse included in his Louvre in miniature. Copying was not considered an end in itself for an artist but was seen as an essential part of the creative process, leading to mastery of technique and informed powers of invention. With the exception of the Brittany woman and her child, all of the visitors to Morse’s Louvre Museum are Americans, most are artists, and three of the young art students are women. This young woman is deeply involved in the making of a miniature painting. Her identity is a mystery. It is possible that she is a Miss Joreter, who took lessons from Morse in the Louvre. It has also been suggested that she represents Morse’s beloved wife, Lucretia, whose unexpected death in 1825 at age 26 left her husband grieving and footloose, sending him to Europe for the prolonged period of study and reflection that resulted in the painting of The Gallery of the Louvre. Mona Lisa, LeonardO da Vinci (1452-1519, Italian, ca. 1503-19. 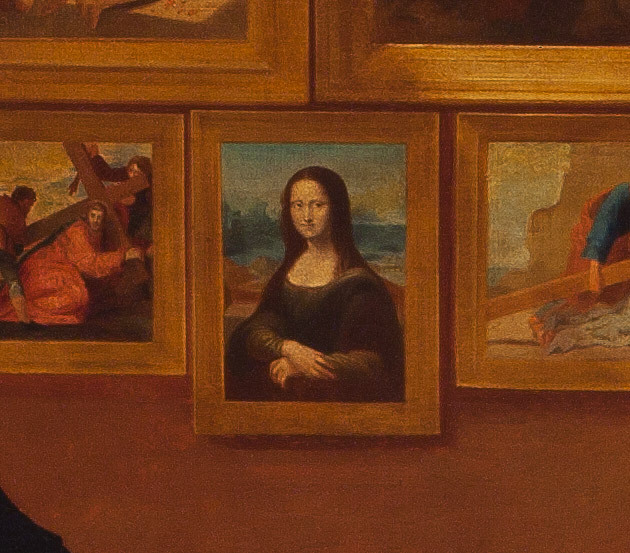 Leonardo’s portrait of Lisa Gherardini, called Mona Lisa, was a favorite of artists at the Louvre in the 19th century. Mona Lisa here hangs just below the portrait of Francis I. The French king had brought Leonardo from Italy to France in 1516, when Leonardo may have been working on the enigmatic portrait still. Francis I purchased the painting from Leonardo’s estate. It was put on public display at the Louvre two centuries later, in 1797. Samuel F.B. Morse was a man of many talents: he was a painter and an inventor, and, in retrospect, he was nothing less than the prophesier of the coming information age. Morse’s intent when he painted Gallery of the Louvre mirrors his intent when he worked to develop the electromagnetic telegraph: his desire was to help spread human knowledge across vast distances. Most notably, with his painting, he wanted to inform American artists and elevate the taste of his countrymen. In Gallery of the Louvre, Morse hoped to educate the American public about the masterworks of European art he saw at the Louvre, “the most splendid…collection of works of art in the world,” he called it. He painted for American art students who lacked appropriate models for learning the art of painting. At this time, it was conventional practice for developing artists to copy a master’s work so as to improve their skills in color, composition, and form. Gallery of the Louvre was designed to offer students the finest examples of the Old Masters, and European art was held up to Americans as representative of the highest level of achievement. Morse chose thirty-eight of his favorite Old Master paintings, and then he scaled them down—painting each in miniature, and rearranged them as he saw fit across the large canvas. Back in New York, he added figures to his gallery. The painting depicts masterpieces from the Louvre's collection that Morse rearranged according to his own tastes and instructional aim. They hang in one of the Louvre’s grand galleries, the Salon Carré. 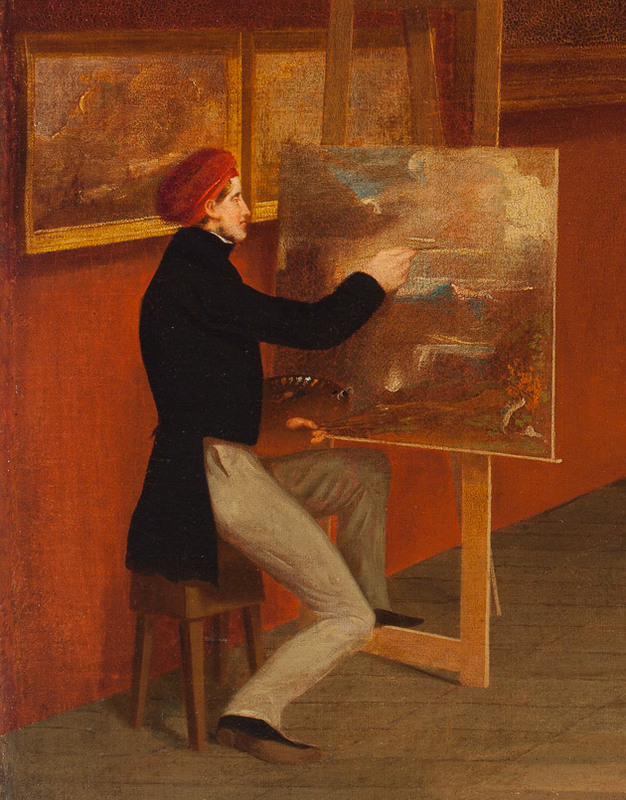 Morse envisioned the gallery as a workshop where artists and art students sketch and copy from the Old Masters, thus honing their skills and feeding their artistic imaginations. Morse selected the paintings he considered the best instructional examples, including Leonardo da Vinci’s Mona Lisa, along with portraits, history paintings, and religious subjects depicted by such artists as Titian, Veronese, Caravaggio, Rubens, Van Dyck, and Watteau. 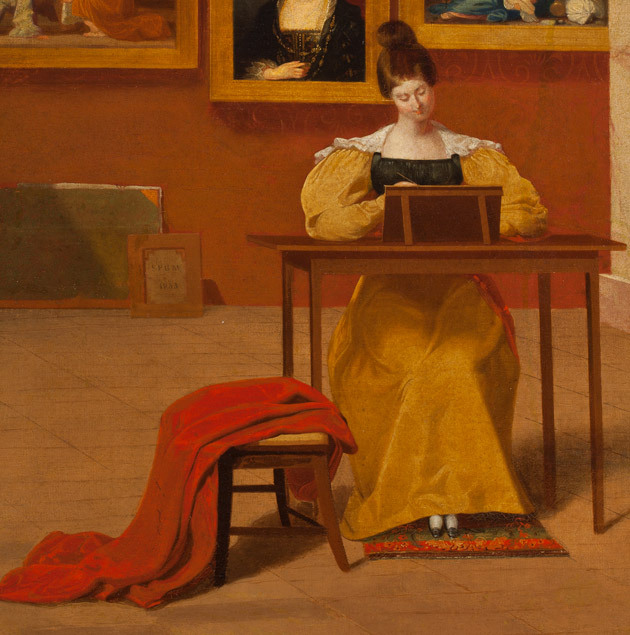 Morse placed himself front and center, instructing a young woman art student who copies one of the masterpieces before her. 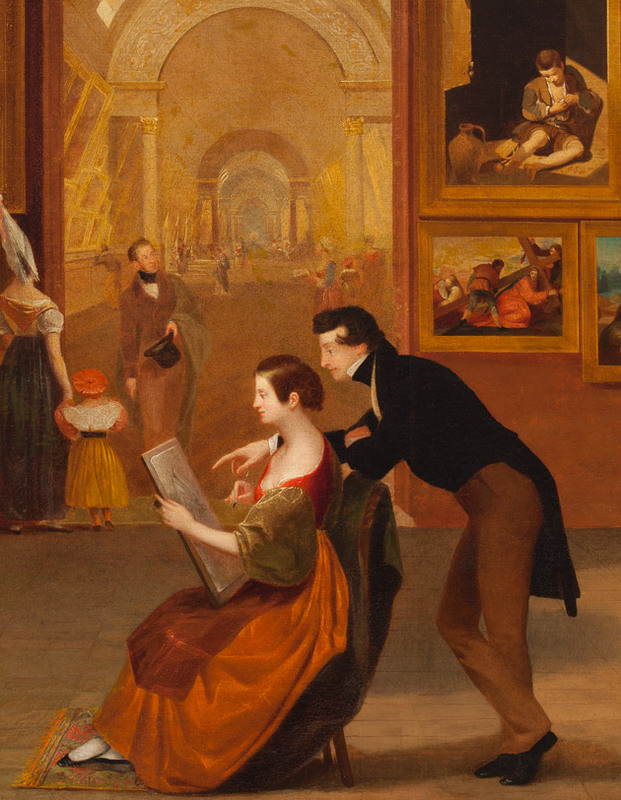 He also introduced some of his American friends in Paris, including the novelist James Fenimore Cooper, who, with his wife, hovers over the canvas of their art student daughter, Susan. 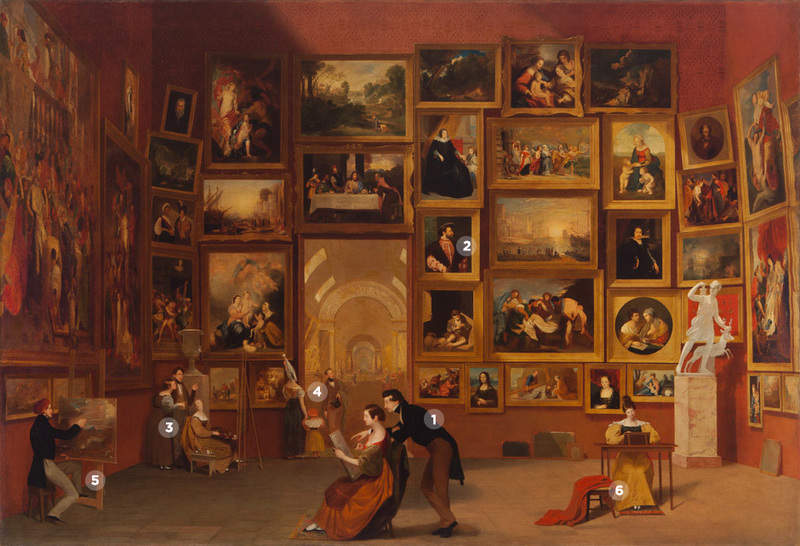 Samuel F. B. Morse's Gallery of the Louvre and the Art of Invention is organized by and with support from the Terra Foundation for American Art. TO LEARN MORE ABOUT MORSE AND HIS GRAND MASTERWORK, PICK UP A COPY OF THE EXHIBITION CATALOGUE, WITH ESSAYS CURATORS AND CONSERVATORS, AND HISTORIANS OF ART, SOCIETY, AND TECHNOLOGY. (PUBLISHED BY THE TERRA FOUNDATION FOR AMERICAN ART). 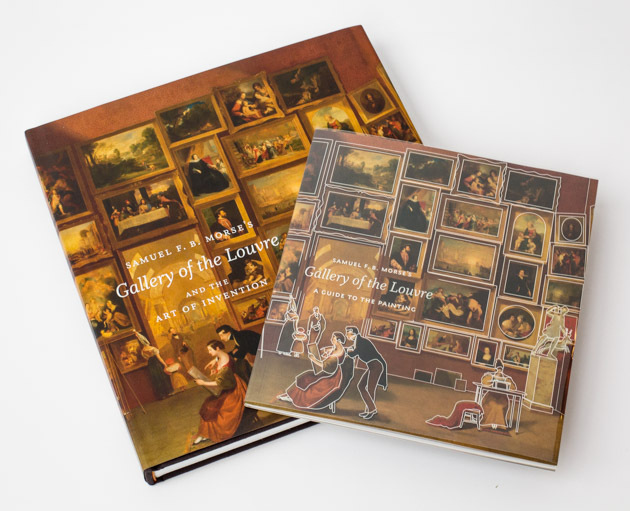 ADDITIONALLY, CHECK OUT THE ILLUSTRATED GUIDE, WHICH OFFERS AN HISTORICAL OVERVIEW OF THE PAINTING WRITTEN BY THE EXHIBITION’S CURATOR, PETER JOHN BROWNLEE, AS WELL AS AN ELABORATE KEY TO THE PICTURES AND PEOPLE IN MORSE’S GALLERY OF THE LOUVRE. (PUBLISHED BY THE TERRA FOUNDATION FOR AMERICAN ART).